Seductive companion to the popular Juliet Immortal, in which former lovers—Romeo and Juliet—meet, not as true lovers, but truly as enemies. Cursed to live out eternity in his rotted corpse, Romeo, known for his ruthless, cutthroat ways, is given the chance to redeem himself by traveling back in time to save the life of Ariel Dragland. Unbeknownst to her, Ariel is important to both the evil Mercenaries and the love-promoting Ambassadors and holds the fate of the world in her hands. Romeo must win her heart and make her believe in love, turning her away from her darker potential before his work is discovered by the Mercenaries. While his seduction begins as yet another lie, it soon becomes his only truth. Romeo vows to protect Ariel from harm, and do whatever it takes to win her heart and soul. But when Ariel is led to believe his love is a deception, she becomes vulnerable to Mercenary manipulation, and her own inner darkness may ultimately rip them apart. 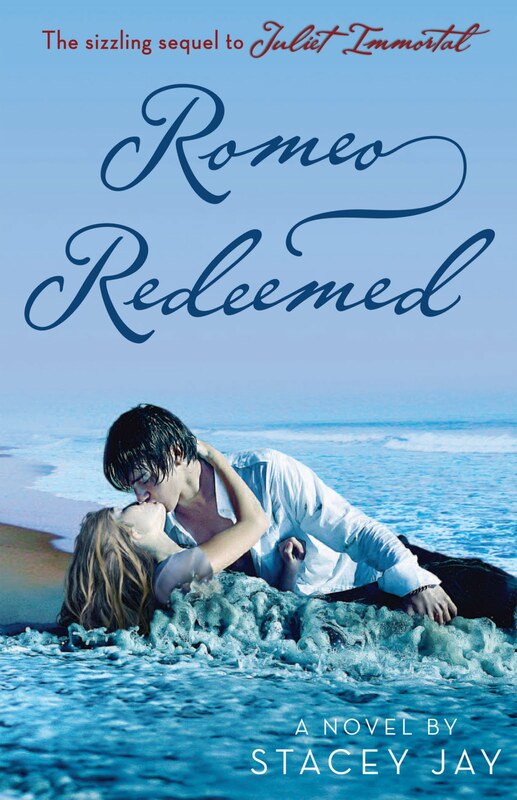 As a bit of a rabid Stacey Jay fan I do find it a bit hard to review ROMEO REDEEMED, because I absolutely loved it! That said it's possible that there will be much mixed opinion among the broader readership on this one. Romeo was just so rotten and evil and confusing as I read JULIET IMMORTAL I know I wasn't the only reader who wasn't sure how he could ever truly be redeemed. But that's the sheer beauty of it. If you've ever been reading a series and realized you really did want to see the villain find his redemption you will find Romeo's tale quite satisfying. You either love Shakespeare or you hate Shakespeare and Jay has done such an exceptional job of making the classic tale of woe into something that works for both the lovers and the loathers. Seeing the bard's play stripped down and gutted then put back together again with a twist of the supernatural is sure to entertain any reader who ever had to sit through it for school. This time around I felt considerably more passion between the characters than I had with JULIET IMMORTAL. Romeo really grows and becomes a character you will want to see get a happy ending. I'll behave myself and avoid the spoilers which is difficult to do but Jay threw in some twists I did not see coming that may not work for all readers but I personally loved. If you read and enjoyed JULIET IMMORTAL don't hesitate to pick up ROMEO REDEEMED, trust me when I say you HAVE to read them together. You won't get all of Juliet's story without it! Ah, I'm saying too much! Just read it. lol If you haven't read the latter you really should or the former will be confusing. I really hope to see an omnibus edition of these someday because you can't really read them seperately. Whether you love or hate Romeo and Juliet I most definitely recommend this duology! Have you read and reviewed this book? Please leave a link to your review in the comments!